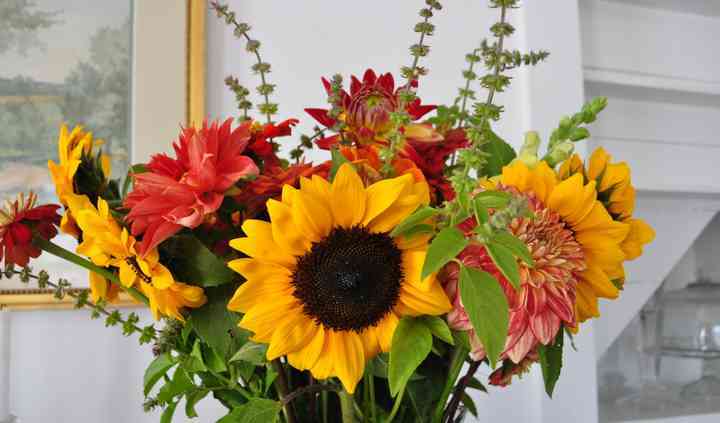 Sweethaven Farm & Flowers is a cut-flower and studio floral designer based out of Ashfield, Massachusetts. Sweethaven is 100 percent owned and operated by women, all of who specialize in authentic, bespoke, fresh-from-the-garden floral arrangements. The team at Sweethaven believes that the flower is central to any wedding day and can dramatically alter the style and mood of your event. With over 25 years of flower farming experience/training and significant training in floral design with world-wide recognized designers, schools and workshops, SHF&F offers a wide range of flowers and design skills to make your event unique and memorable. 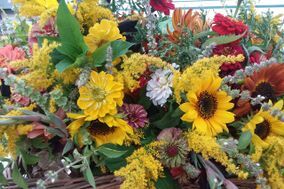 Sweethaven Farm & Flowers grows a wide range of flowers on their own 10 acre farm in Ashfield, MA. We offer over 75 varieties of farm-grown flowers including peonies, sweet pea, hyacinth, lilac, lily of the valley, sunflowers, zinnias, dahlia, foxglove, hydrangea, delphinium, double tulip, anemones, ranunculus, fragrant herbs and so much more (visit our website at www.sweethavenfarm.com for a full listing and where you can sign up for our mailing list for information about what is blooming). All of our flowers are fresh-picked and made-to-order. In addition to DIY bulk flowers, they also offer a wide range of floral services to help you bring flowers to your special day without any stress or hassle. We gladly work with a number of local farms and wholesalers to provide you with the best and highest quality selection of flowers not available on the farm to create beautiful, synthesized floral installations and arrangements for your chosen venue and style. For brides who book early, SHF&F has the ability to grow specific flowers to offer you something different and unique for your day or to create that sentimental connection through flowers. We are always happy to discuss what varieties would work well with your date. We had a wonderful experience working with Sweethaven Farm & Flowers for our wedding. They grew flowers for the bouquets, table arrangements, arbor, and corsages for our wedding, based on our ... Read more requested colors (and what was in season), and they were gorgeous and in perfect condition. Delivery was seamless as well. Their communication was friendly and professional -- we couldn't have asked for a better experience! 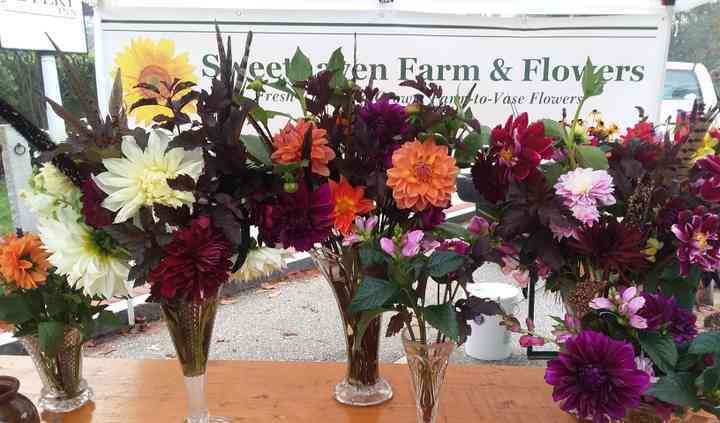 Working with Sweethaven Farm & Flowers was a wonderful experience. They were responsive, stayed in touch with me, told me about the flowers in season, very helpful with any questions and delivered on ... Read more time. The flowers were beautiful and made gorgeous centerpieces for my daughters wedding. We were extremely happy with them! I used Sweethaven Farm’s flowers for the tables at my son and daughter-in-law’s rather large mid-September wedding rehearsal dinner. 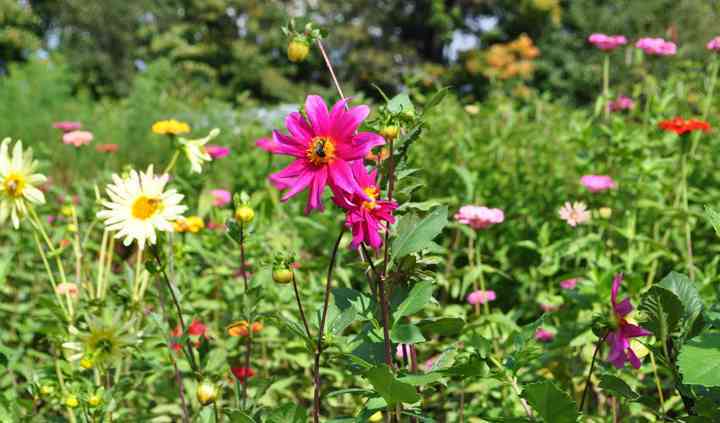 I advised Sharon, the owner, of what colors and types of flowers ... Read more that I was looking for, wanting a mixture that appeared to be freshly cut from home garden perennial beds. She provided us with the most beautiful, fresh assortment; in particular, the dahlias were stunning! Sharon is a lovely person and an utter joy to work with! I highly recommend using Sweethaven Farm, I was totally pleased! Thank you, Karin A. Free Delivery to Ashfield, Conway, Buckland, Goshen, Plainfield, Shelburne Falls, Charlemont, Cummington, South Deerfield, Amherst, Greenfield, Florence, Northampton, Whately and Hatfield, MA.